Next Picture: East Sydney CBD - East Sydney CBD. Previous Picture: West Sydney CBD - West Sydney CBD. See more about the Sydney City: Sydney City Central How to get to: the Sydney Opera House. 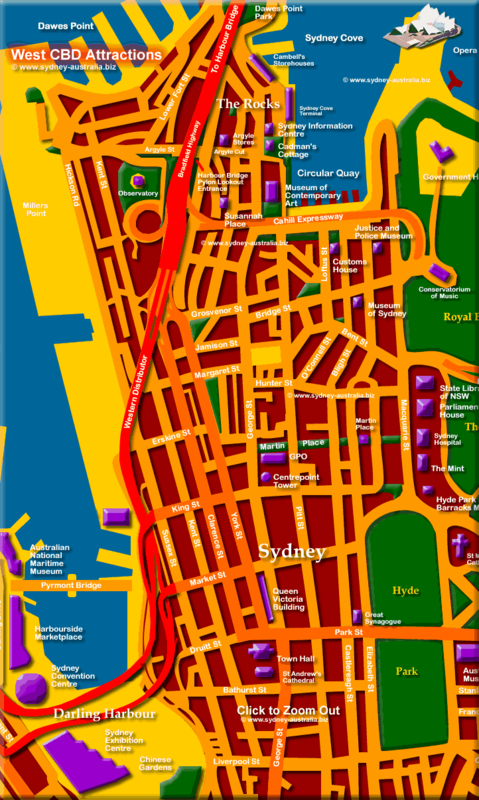 See Sydney Opera House Map. To see Information about Sydney Wine and Winery Tours Sydney Wine Tasting Tours Hunter Valley. More about where to go and what to see in Australia Australia Tourist Guide. Thinking about a working holiday in Australia? See information - how to get jobs and Work in Australia. To see more information on the many attractions in Australia and the Sydney CBD Center. Sydney accommodation includes hotels, motels, luxury resorts, caravan parks, camping, bed and breakfasts, backpackers and youth hostels.